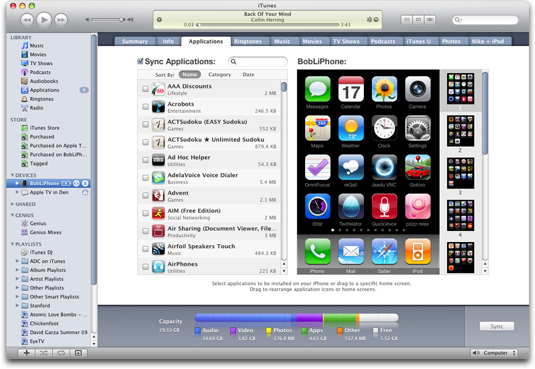 On September 9, 2009 — in addition to introducing an all new (and improved) lineup of iPods — Apple released new versions of iTunes and iPhone OS. iTunes LP is the modern equivalent of the old vinyl record album. iTunes LPs offer an immersive combination of features such as performance videos, lyrics, artwork, liner notes, interviews, photos, album credits and more. Bob Dylan’s “Highway 61 Revisited,” Norah Jones’ “Come Away With Me,” The Grateful Dead’s “American Beauty” and Dave Matthews Band’s “Big Whiskey and the GrooGrux King: iTunes Pass” are among the initial iTunes LP offerings. On the video front, Apple introduced iTunes Extras, which offer a similar experience — but for movies instead of music. iTunes Extras may include features such as documentaries, deleted scenes, interviews and interactive galleries. iTunes Extras is now available for select movies in the iTunes Store including “Twilight,” “Batman Begins,” “WALL-E,” “Iron Man” and “The Da Vinci Code.” iTunes LP and iTunes Extras can be enjoyed on either a Mac or a PC. iTunes new Home Sharing feature lets you browse the iTunes libraries of up to five authorized computers on your home network, import your favorites from any or all five, and automatically add new purchases made on any of the other authorized computers to your own library. My family already LOVES this one. Other new iTunes 9 features include improved syncing, smarter smart playlists, Facebook and Twitter integration, and a bunch of other tweaks. One of the coolest new features are Genius Mixes. They’re generated for you based on the results of over 27 million music libraries with over 54 billion songs that have been submitted and analyzed by Genius. It’s like having a “Genius” DJ to automatically generate endless mixes of songs that go great together from the songs in your iTunes library. 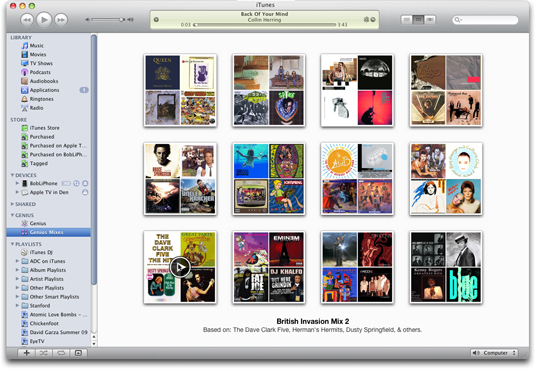 Genius Mixes are generated based on the contents of your iTunes music library. Finally, the iTunes Store itself received a makeover and now has a cleaner look, improved navigation, and several additional new features. 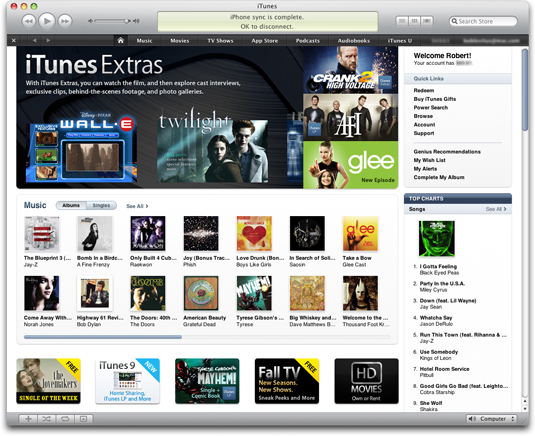 The iTunes Store received a makeover in iTunes 9. One of my favorite new features is that I can now use Voice Control (on iPhone 3GS) with any Bluetooth headset. So, I can finally dial phone calls (and do much more) hands-free. But my all time biggest favorite feature is one that involves both iTunes 9 and iPhone 3.1: The ability to organize the icons for all 11 pages of iPhone apps in iTunes. Just drag the icons where you want them in iTunes and they will automatically appear on your iPhone with the same layout. Hallelujah! Drag and drop icons in iTunes to rearrange them on your iPhone. iPhone OS 3.1 is a free update for iPhone users. Launch iTunes 9, connect your iPhone, select your iPhone in the source list on the left side of the iTunes window, click on the Summary tab, and then click the Check for Update button to download and install the iPhone OS 3.1 update.